With Christmas being over, it was time to come up with a new centerpiece for our table. 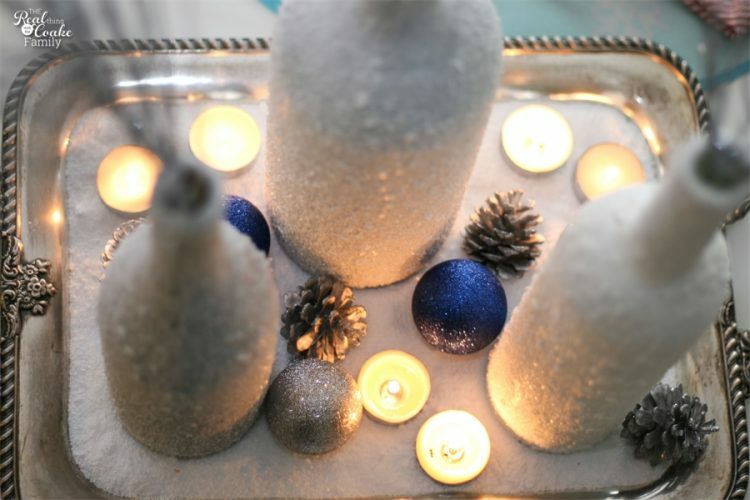 Today, I'm going to show you our winter centerpiece. Isn't it pretty and wintry? I LOVE the way it turned out. I know that lots of people go from Christmas to decorating for Valentine's day. We don't do that. We usually don't do anything Valentine until February 1st. Then, because our anniversary is at the end of February, I usually leave all the heartsy, cutesy stuff up until the end of February. 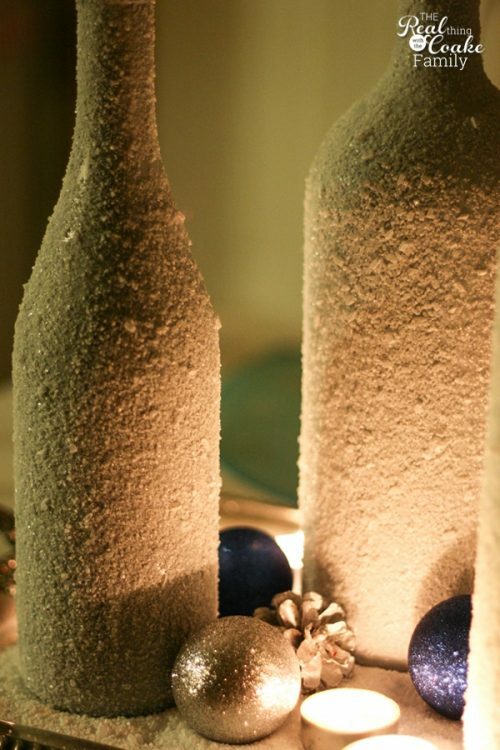 The centerpiece is made from wine bottles and Epsom salt. 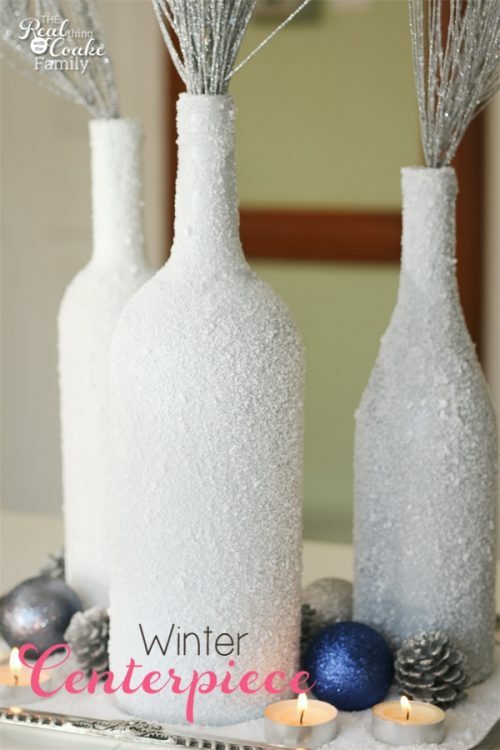 I have a tutorial for you: Wine bottle crafts. I found the glittery ornaments on clearance after Christmas. (affiliate link) on clearance after Christmas. It was one large branch that Mr. T cut up for me with wire cutters. I tried to cut it up, but I apparently have wimpy hands and he has gorilla strength hands. 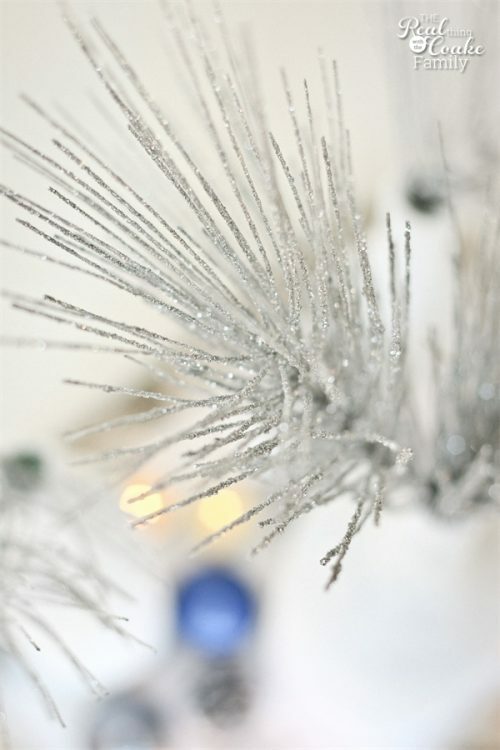 I love how these branches look…wait until you see it at night. 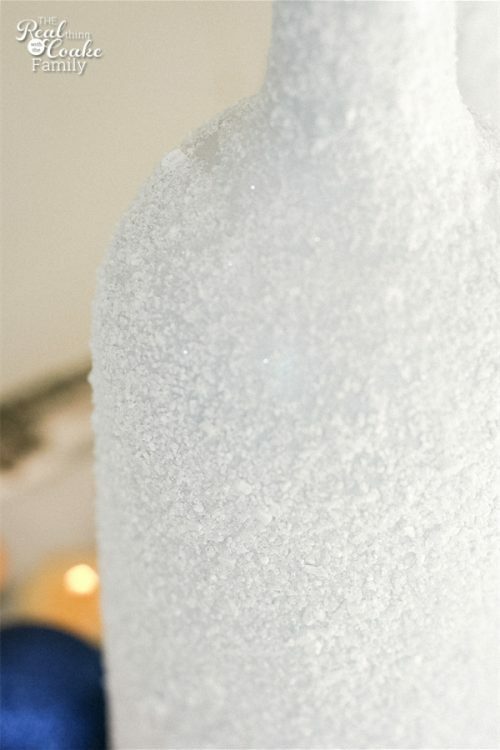 The beautiful bottles were very easy to make. 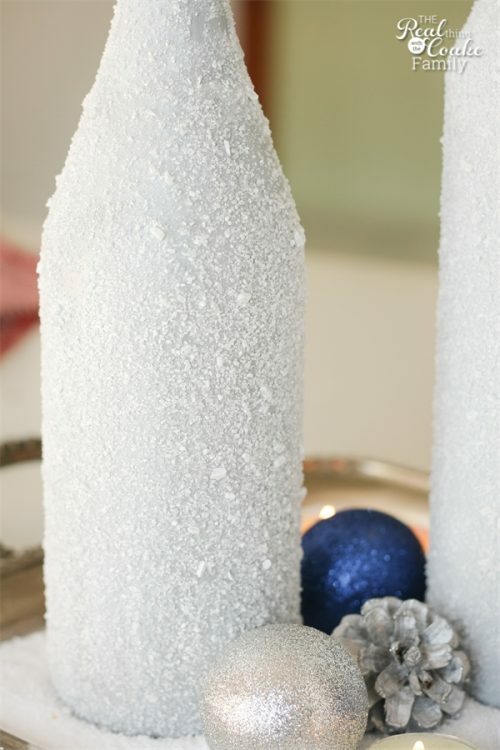 The bottles were so easy to make I made them during one of my 30 hours of continuing education credits I managed to cram into the holiday season…ahh procrastination…ain't it fun! Can you see the glitter and sparkle in the bottles? 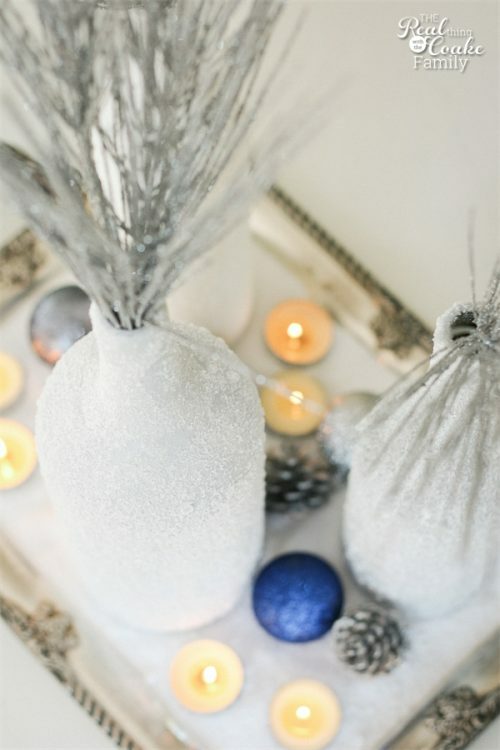 To me it makes the table look so sparkly and wintry. A lit up at night. It was Pumpkin's idea to add the Epsom salt to the bottom of the tray. I think I have a mini designer on my hands! My absolute favorite shot I took. I got a new lens and had fun trying things out for this post! 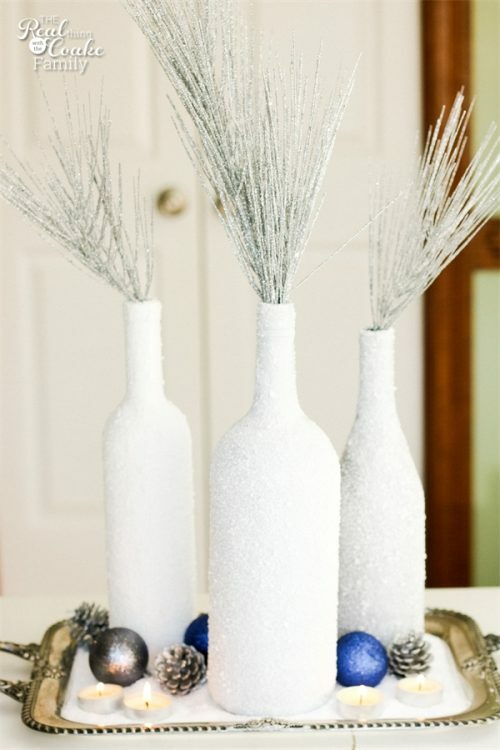 If you want to make your own winter centerpiece, just head over to my post about the wine bottle crafts. Gorgeous centerpiece! 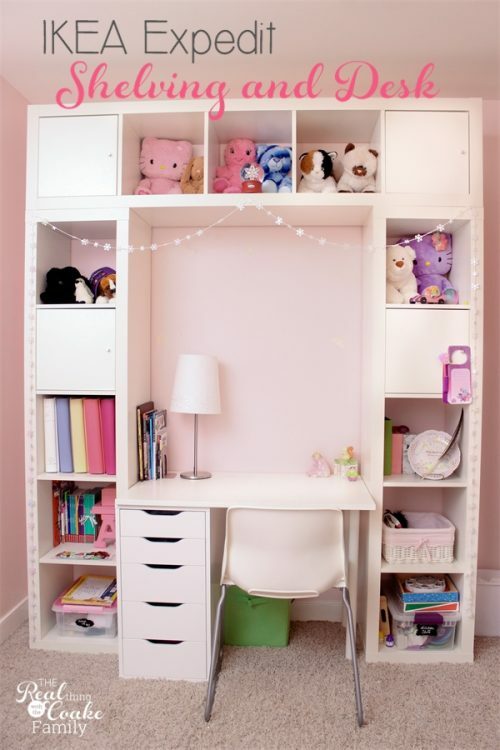 When I scrolled down I did an “Awwww!” out loud when I saw it lit up. Very pretty! Very cool! I love how wintery it looks! Thank you! I really like how wintry it looks as well. Certainly hit the mark there, right?! Wow, these are beautiful! I can’t believe you made them with Epsom salts. I’m definitely going to have to try this. They would make a great gift also. 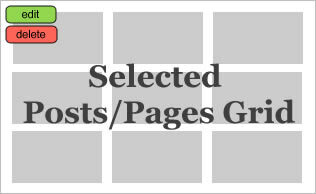 I host a link party each Thursday and would love for you to share this. Thanks! Isn’t it amazing what you can do with simple items. I will show you the tutorial on Friday. They are really easy to make. I have seen them up close and personal. They are smashing!! Tune in Friday! These look great. Perfect winter look. So so pretty and elegant! You should link these up this week on The CSI Project. 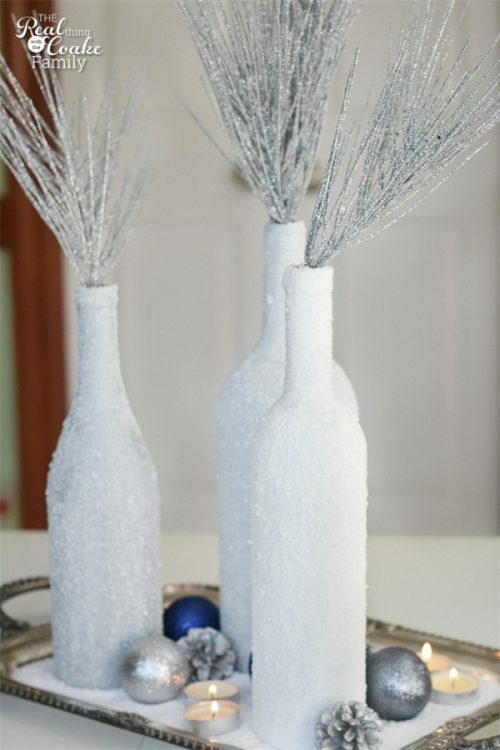 The challenge is winter crafts and decor. Right now our server is down but check back soon. The link up begins Thursday. Each week is a new craft challenge so join us! So beautiful! I love how it looks during the day and night. Very pretty centerpiece! I love the touch of blue. Thanks, Gail! I love the addition of the blue, too. It adds a little something. Those frost covered bottles have me captivated! VERY awesome!